New sprinklers added onto an existing garden watering system in South Cheshire. Three Way Valve Pit – Pre-Installation test fitting. Two phase design for residential property on outskirts of Crewe. Ongoing works at a large residential property in Cheshire. Another aerator being installed in large residential site in Peeover, Cheshire..
TCR called in to install a new pump. TCR are currently installing a sub surface mixer for an existing client, to the lake of a large residential property in Cheshire. TCR were commissioned by a North West building contractor, to install a small automatic watering system to a new build in Hale. 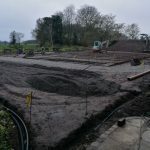 The system consisted of a tap timer, approximately 800m of dripline, watering newly planted trees, new hedges and border hedges. Fed from a borehole the 8 station system waters the flower beds surrounding the house using micro sprinklers. Install an automatic watering system to the formal gardens and golf greens in rural Cheshire. 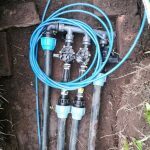 Installation and design of garden irrigation to a garden in Altrincham. TCR were commissioned by a local world renowned construction company to install a 6 station watering system to the main lawn and flower beds.